The Emergency Medical Services Authority (EMSA) oversees approximately 18,000 paramedics and prepares for medical emergency disasters. It licenses and disciplines paramedics, coordinates disaster response, sets education and training standards for emergency medical service providers and develops guidelines for local emergency medical service systems. The Authority is in the Health and Human Services Agency. Emergency medical services have a history dating back centuries to at least the Greek and Roman eras when chariots removed injured soldiers from the field of battle. The Spanish utilized large tents, called ambulancias, for medical supplies and surgical treatment in the 15th century. A model for treating soldiers in the battlefield developed by the French in the late 18th century was adopted by Americans during the Civil War and led to the first municipal-based EMS system in New York City in 1869. The Red Cross began providing first-aid training across the country in 1910 before two world wars accelerated the development of emergency medical services. EMS was primarily local and run by hospitals and fire departments until the 1970s when the federal government began setting standards for the country. Gradually third-party providers joined rescue squads, private ambulances and fire departments. Advances in the use of medical techniques like cardiopulmonary resuscitation (CPR) fueled development of new emergency medical systems through the 1950s and 1960s. The National Highway Traffic Safety Administration was created in 1970 and developed an EMS education curriculum and model state EMS legislation. An influential report released in 1970s by the National Academy of Sciences and the National Research Council (NAS/NRC) advocated a federal-to-state shift of control. The EMS Systems Act of 1973 gave localities a block grant financial incentive to develop their own programs, and they did. But after a decade of debate between competing agencies over how to structure EMS support, the federal government eliminated block grant support in 1981 and tossed the ball in the state’s court. Some states, like Maryland, responded by centralizing control at the top while others, like California, took a less active role. California state government continued to investigated EMS system complaints and set EMS training standards, but otherwise left the overall direction of EMS systems to localities. California’s 1971 Wedworth-Townsend Pilot Paramedic Act (SB 772) had given counties the option of establishing paramedic care, also known as pre-hospital care, to increase survival rates for victims of accidents and disasters. But it wasn’t until the Emergency Medical Services Authority was created within the California Health and Human Services Agency in 1981 that a centralized resource to oversee emergency and disaster medical services in the state existed. Over the years, federal support of EMS programs has become fragmented with multiple entities participating in the effort but without the designation of a true lead agency. The National Highway Transportation Safety Administration still operates its EMS office, but agencies that handle Medicare and Medicaid, rural health policy, trauma and prevention, and, most recently, Homeland Security bump heads with each other (as do states and localities) over coordinating their activities amid overlapping jurisdictions. Although the Authority coordinates the local, state and federal response to a disaster, at least 11 others agencies would participate if a major earthquake hit or a nuclear reactor went awry. That includes the National Guard, the Department of Transportation, the Department of Social Services, the Office of Homeland Security and the Office of Emergency Services. The unpaid 18-member Commission on Emergency Medical Services provides advice to the EMS Authority. Twelve members are appointed by the governor, three by the Assembly Speaker and three by the Senate Rules Committee. Each commission slot has a specific professional requirement, so the commission is made up of three physicians; a nurse; a county health officer; a paramedic or emergency medical technician (EMT); a pre-hospital emergency medical service provider from the private sector; a fire protection and prevention services manager; a hospital administrator; an EMT-trained peace officer; two public members who have experience in local EMS policy issues, at least one of whom resides in a rural area; an administrator from a local EMS agency; a medical director of a local EMS agency; and an active member of the California State Firefighters Association or the California Professional Firefighters. * Licensing for paramedic professionals. * Regulation of emergency medical technician procedures. * Setting of standards for trauma center and trauma system operations. * The coordination of ambulance services and disaster medical responses. * The operation of the EMS Central Registry that provides public access to the licensing and certification status of EMTs and paramedics. * The management and staffing of three 200-bed mobile field hospitals, 39 disaster medical-support, ambulance-supply units and three 40-person medical assistance teams that are prepared to respond to major disasters. EMSA’s Disaster Healthcare Volunteers program mobilizes professional volunteers, with about 14,000 registrants comprising 47 license types including physicians, nurses, paramedics, pharmacists, dentists and medical technicians. About 44% of EMSA’s $27.4 million budget is spent on personnel and operating expenses. The rest is doled out in grants and other funding to localities. There are 31 EMS agencies that serve single counties or multi-county areas. The 31 EMS agencies govern their own daily operations while the EMS Authority works with the local agencies to standardize quality EMS care statewide. A little over half the EMSA’s funding comes from reimbursements for services rendered. The state’s General Fund kicks in a little less than 25% and the federal government covers around 10%. Fees raised from licensing paramedics cover 5.8% of expenses. 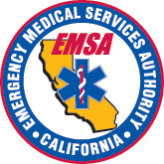 A series of stories by the Sacramento Bee in 2007 documented a troubling lack of oversight by the EMSA in the area of licensing and certification of paramedics. One article detailed the lives of a series of unqualified paramedics who hid their backgrounds and lack of qualifications in myriad ways. The newspaper said its 3-month investigation discovered long delays by the state in assessing penalties and almost no criminal prosecutions. Richard Carter Brown was convicted of a felony and jailed for stealing a car in Stockton and conspiring to kidnap a child for ransom. He kept all that to himself when he applied for a license in 1994 but shared a bit while seeking to renew it in 2000. Apparently, it was a bit too much sharing because an investigation turned up that Brown also lied about his qualifications. North Coast paramedic David Lanning forged signatures and conjured up fake records of hours spent on hospital emergency room internships. David Jose Martinez resigned from the Galt Fire Department after authorities said they discovered he had used another paramedic's license number to manufacture a state license card. Martinez was a paramedic for six years; he even trained rookies. EMSA Director Dr. Cesar Aristeiguieta said that license fraud wasn’t a large problem in California but the newspaper found the picture clouded by a dearth of up-to-date state statistics. Official EMSA numbers were only available for one three-year period, 1998-2000, during which the state discovered 60 cases of licensing and certification fraud and another seven more cases where people unlawfully impersonated a paramedic. The detection of certification fraud is spotty at best partly because, EMSA says, the Authority doesn't have the resources to scrutinize an estimated 500 license applications and renewals each month. Dealing with fraud is complicated by a division of labor between the state and localities. State safeguards appear on paper, but it falls to the local public agencies, fire departments and ambulance companies to ferret out the fraud. At the end of 2006, 31 paramedics in California were on probation for alcohol or drug problems while 18 with a history of abuse were still working but with provisional licenses. In 1999-2000, only eight cases of substance abuse were handled by the Emergency Medical Services Authority; six years later it logged 65 cases in a two-year period. The Authority was enforcing the rules for 16,000 paramedics in California with a 4-person office. But, as an investigation by the Sacramento Bee in 2007 showed, official statistics don’t tell the story. Employers don’t have to report paramedics who take medical leaves for substance abuse treatment. Others are quietly forced to leave and an untold number of abusers are never discovered. And then there are thefts too brazen to ignore. Paramedic Michael Carey, high on drugs and low on cash, relieved 72-year-old Cleotilda Maria Arroyo of $6,100 in cash as she layed bloody and unconscious in a car near Modesto. Arroyo was going to use the money for a house in Mexico. Carey’s choice of drug was Librium, a drug often prescribed for alcohol withdrawal – which he consumed with alcohol. Shortly after the June 2005 theft, Carey’s paramedic license was temporarily suspended for alcohol abuse. Then his estranged wife turned him in to the police for the theft. The EMSA didn’t know about the theft charge and in October let him go back to work as long as he didn’t drink. That didn’t last long. He was busted by a surprise 6:30 a.m. Breathalyzer test on October 24 and his license was suspended again. But it wasn’t until Modesto police arrested Carey that EMSA became aware of the crime and pulled his license in December. Big cash scores are attention grabbers, but unusual. Much more usual is morphine theft. The newspaper investigation found 17 states besides California reporting morphine theft by paramedics. David Strous stole at least 10,521 milligrams of the drug (1,000 vials) before getting caught in 2000 and losing his license. Richard Rolston, a 20-year veteran paramedic in Big Bear suffering from painful pancreatitis, absconded with at least 350 vials of morphine before turning himself in 2006 A Sacramento Fire Department investigation of 43 missing vials of morphine never did turn up an official suspect although a captain refused to answer questions and retired. What do you do if you’re a paramedic who has been stripped of your license? You may have skills, probably training and often knowledge of how the emergency medical assistance system works. The Sacramento Bee, in a 2007 investigation, noted that in California it’s hard to pass on becoming an emergency medical technician. Paramedic Floyd Horn groped a patient in his ambulance in 1997, paramedic Michael Chance neglected a patient who died in 2000, and paramedic Keith Harbrecht got a 16-year-old girl drunk and fondled her in his tent during a work-sponsored Explorer camping trip in 2002. That cost them their state paramedic licenses, but all three obtained EMT credentials from local agencies and went back to work serving the public. While the Emergency Medical Services Authority licenses the state’s 16,000 paramedics, the 70,000 or so EMTs are certified by local authorities whose certifications are honored across the state. Unlike a number of other states, no single authority has oversight of the two professions whose members share similar skills. (EMTs have less advanced training.) Not nearly as many problems are found in states where one government agency handles paramedics and EMTs, according to the newspaper. Left to their own devices, counties and regional agencies tend to be more lax than the Authority. A 2005 EMSA survey found that 31 of 32 county and regional agencies queried didn’t do FBI checks on EMT applicants and 14 didn't conduct Department of Justice background checks. Orange County EMT-firefighter Raymond Carl Smith worked for nearly two decades after his 1985 conviction for child molestation, regularly renewing his credentials with the state fire marshal. That ended in 2004 when Smith was arrested on suspicion of molesting two girls. He was immediately given a desk job before retiring with a full pension. In September 2008, Gov. Arnold Schwarzenegger signed legislation that required the Authority to develop standards for certification, disciplinary orders and conditions of probation for EMTs. The Emergency Medical Services Authority established a program in 2006 to support three mobil field hospitals strategically located around the state. The hospitals are stored in warehouses for use in catastrophic emergencies and can be transported by air, land or sea although they have never actually been used in a real world medical emergency. Most of the $18.3 million to set up the program came from the state’s General Fund, with the federal Department of Homeland Security and Hospital Preparedness Program kicking in a few dollars. But the 2011-12 proposed budget eliminated the $1.7 million annual funding that kept the program going, sending the Authority scrambling for local and state partners, as well as private entities, to make up the shortfall. The role of the 18-member Commission on Emergency Medical Services is limited to providing advice to the Authority and approving regulations when presented by the EMSA. The proposed 2011-12 budget proposed elimination of the commission at a savings of $38,000 ($9,000 from the General Fund). And every year the state weathers a hearty onslaught of season’s greetings. Some 40 or so state agencies have leadership or supporting responsibilities for emergency preparedness. But is the state, and the Authority, ready for when disaster strikes? The commission’s critique focused mainly on agencies larger than the Emergency Medical Services Authority, calling on the state “to consolidate the Office of Emergency Services and the Office of Homeland Security, led by an experienced leader appointed by the governor.” However, the report did say the roles and responsibilities of the Medical Services Authority and the state Department of Health Services were unclear. “State officials report that EMSA is responsible for the initial triage and transport of victims to hospitals, while Health Services is responsible for ensuring adequate hospital response. But health officials point out that field care and hospital services must be integrated and cannot be separated by the emergency room door.” The report said a major earthquake could injure as many as 35,000 people and leave 3,400 people dead. Even the Medical Services Authority acknowledged in its own December 2008 operations manual that the state’s disaster medical system is undergoing “significant change as it faces new challenges.” Some of those new challenges go beyond trying to find new ways to cope with old “seasonal” changes. Since the attacks of September 11, the threat of terrorism has forced the state to plan for a contingency it has never experienced. California has loads of experience with devastating wildfires, earthquakes, mudslides, civil unrest and flooding, but it’s been more than 100 years since a major city was knocked flat by disaster. It hasn’t experienced “the big one” in modern times, felt the fury of a terrorist strike or dealt with a nuclear meltdown. In the dissenting opinion, Little Hoover Commission member Loren Kaye said the critique was overstated, strong on rhetoric and short on factual argument. Kaye said that “the findings in the report sell short the incredible talents and accomplishments of California’s state and emergency services professionals.” He wrote that, according to expert testimony, California emergency agencies have long excelled at mutual aid. Kaye pointed out that California had responded to 19 major disasters since 1989 and more that 1,200 states of emergency since 1950. In 1997, floods required the relocation of 200,000 people. As a result, emergency planning in California is an ongoing activity and no state is more successful in procuring federal assistance in undertaking projects to mitigate the effects of disaster through infrastructure development. Appointed director in July 2011, Dr. Howard Backer received a bachelor of science degree from the University of Michigan, a master of public health degree from the University of California, Berkeley, and a doctor of medicine from the University of California, San Francisco. Dr. Backer practiced emergency medicine in private practice for 25 years before entering public service. The doctor served in a number of positions from 2000 to 2008 at the state Department of Health Services, including chief of immunization. He became associate secretary for emergency preparedness at the Health and Human Services Agency in 2008 before being tapped as the interim director at the Department of Public Health early in 2011. By statute, the EMSA director must be a physician with experience in emergency training. Reflecting a lifelong interest in wilderness and travel medicine, Dr. Backer is a founding member of the Wilderness Medical Society and a fellow of the Academy of Wilderness Medicine. He also is medical consultant for an international adventure travel company and is an expert in field water disinfection and infectious diseases of travelers. He still works clinical hours in Urgent Care at the University of California, Berkeley Student Health Center. Dr. Backer lives in Piedmont with his wife, a registered nurse. They have three children.